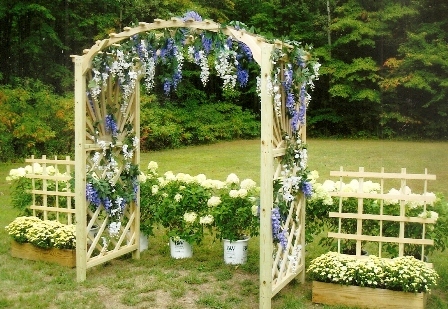 Our Trellises come in 5 or 6 standard sizes and we also offer more than 10 designs that can be customized to your needs. Our eight inch trellis will fit inside a 4" pot. The ten foot trellis design will espalier a fruit tree. Country Craft can accommodate just about any shape or size of trellis to fit the individual needs of your nursery or greenhouse. If you would like more information on custom trellis designs, please feel free to contact Country Craft of Dundee, Michigan by calling our toll free number at (800) 949-5551.